If you want to understand how the cell membrane works, Adam Cohen says, look no further than your kitchen. Cohen, a Professor of Chemistry and Chemical Biology and of Physics, is the lead author of a new study that upends the conventional theories about the fluid nature of cell membranes and how they react to tension. Scientists have long believed that membranes act like a viscous liquid, akin to honey, and that tension could be transmitted almost instantly from one side of a cell to the other, but Cohen and Zheng Shi, a post-doctoral fellow working in Cohen's lab showed they're actually closer to a semi-solid like Jell-O. The study is described in a November 1 paper published in Cell. 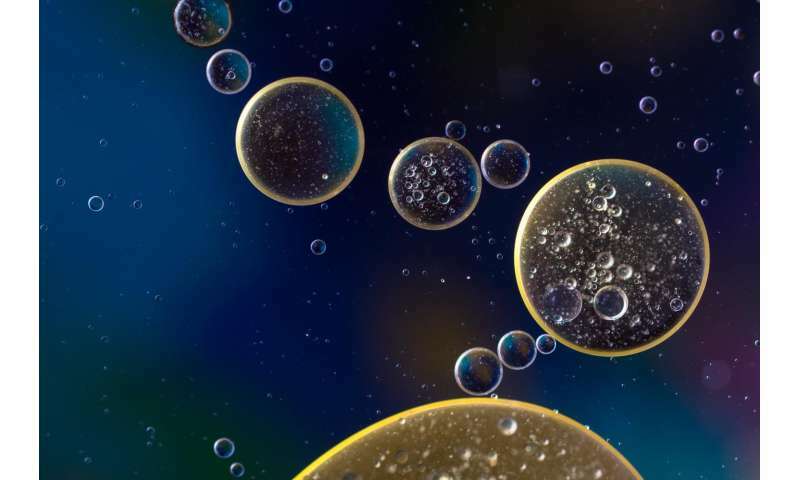 "The conventional picture is that the membrane is what we call a two-dimensional fluid, meaning the lipid molecules that make it up are stuck in the plane of the membrane...but within that plane those molecules can move around," Cohen said. "It's like people milling around in Grand Central Station—everybody is stuck to the plane of the floor, but they can move around. People have done experiments in which they labelled trans-membrane proteins that sit in the membrane and were able to watch them diffuse around. "People had assumed that because the membrane acted like a fluid, if you tugged on one side of it, it would flow until the tension was equalized again," he continued. "People thought this propagation of tension would be very fast, and that it might be a way for cells to signal from one part of the membrane to another." But while there had been many studies suggesting membranes worked in that way, there was scant experimental evidence to support it. What work there was, Cohen said, came from experiments in which researchers created "synthetic" membranes, and then showed that tension was almost instantly transmitted from one side to the other. With that understanding in mind, Cohen and Shi set out to see that tension transfer in action by developing a fluorescent protein that would light up as the signal moved through the membrane. "The idea was that we have this incredibly sensitive sense of touch which acts through these tension-gated ion channels, and I thought it would be cool if, instead of just having touch generate electrical signals in our neurons...if we could see the touch directly," Cohen said. "So Zheng made these sensors and we were trying to calibrate them by pulling on one side of a cell and looking for changes in the signaling, and his experiments just didn't make sense. He kept doing the experiment and not seeing any response." While it might have been easy at that point to simply decide the experiment didn't work and give up, Cohen and colleagues instead began to wonder whether those basic assumptions about cell membranes might be wrong. "So Zheng set up a very simple experiment where he had two probes on mechanical actuators," he said. "He tugged on the membrane in two places and measured the tension...and saw no coupling whatsoever. So he could pull all he wanted on one end, and there would be absolutely nothing on the other. Then he did the same experiment in free membranes disconnected from the cell, and he saw perfect coupling. That tells us there was something fundamentally different about the membrane when it was on the cell versus when it was isolated." That fundamental difference, Cohen and colleagues hypothesized, are the proteins that—in living cells—sit in the membrane and are attached to the cell's cytoskeleton. "Those proteins can't move around," Cohen said. "And each one acts like an immobile barrier, so any flow has to go around it—it's as if you have a number of people in Grand Central Station who are simply standing still." Cohen and colleagues estimated those proteins occupied as much as 20 percent of the cell membrane—enough to have a profound impact on how the membrane works. "You might think that if you take up ten or 20 percent of your space with obstacles you would see a ten or 20 percent effect, but it turns out to have a ten-thousand-fold effect on the ability of the membrane to flow," Cohen said. "The analogy that everybody is familiar with is Jell-O. When you make Jell-O, the gelatin is only about five percent of the recipe—the vast majority is just water. "A five percent solution of sugar flows just like water, but a five percent gelatin gel doesn't flow at all, because the gelatin strands are tangled up and can't move relative to each other, so water gets trapped because it can't flow through the molecular-sized spaces between the strands," he continued. "But if you take clear Jell-O and put a drop of dye on it, the dye molecules will diffuse through it...because the molecules are small enough to squeeze through." The same principle, he said, appears to be at work in cell membranes. "Individual molecules look like they're diffusing around freely because they basically are—they can squeeze through the cracks," Cohen said. "But that shouldn't lead you to the erroneous conclusion that the membrane flows like a liquid, because there are obstacles that are stuck in place and act like the gelatin." Going forward, Cohen said there are two avenues for further research. "It still would be interesting to have a good way to image the membrane tension," he said. "So we are back to the original question to explain how tension is regulated in cells as they get inputs of different sorts." Cohen also plans to explore whether there may be some cells that do transfer tension across the membrane with the hope of exploring what special roles those cells may be filling. The new understanding of how membranes work, Cohen said, could have major impacts not only on how scientists conduct biology experiments in the future, but might even one day have implications for how we treat disease. "Membrane signaling is fundamental for almost all aspects of life because that's how information gets from outside cells to inside cells," Cohen said. "The vast majority of drugs act on trans-membrane proteins. All of our neurons, all the ion channels and the synaptic receptors are all trans-membrane proteins, so I expect there will be many places where this turns out to be an important parameter. "But now that we know tension is not uniform—and in fact can be quite different in different parts of the cell—this suggests that it might be something cells use to regulate different processes," he continued. "So assays people do on proteins in these synthetic bilayers where the tension is homogenous might miss important regulatory mechanisms...so this is a parameter that people will have to think about."